Every family is different, and not everyone wants the same type of funeral. burial arrangements practices are influenced by religious and cultural traditions, costs and personal preferences. These factors help determine whether the funeral will be elaborate or simple, public or private, religious or secular, and where it will be held. They also influence whether the body will be present at the funeral, if there will be a viewing or visitation, and if so, whether the casket will be open or closed, and whether the remains will be buried or cremated. This type of funeral, often referred to by funeral providers as a ‘traditional’ funeral, usually includes a viewing or visitation and formal funeral service, use of a hearse to transport the body to the funeral site and cemetery, and burial, entombment or cremation of the remains. 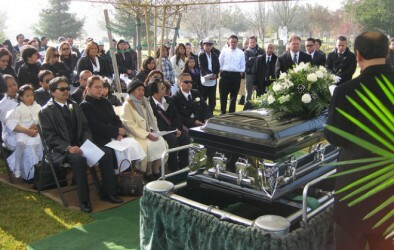 It is generally the most expensive type of funeral. In addition to the funeral home’s basic services fee, costs often include embalming and dressing the body; rental of the funeral home for the viewing or service; and use of vehicles to transport the family if they don’t use their own. The costs of a casket, cemetery plot or crypt and other funeral goods and services also must be factored in. The body is buried shortly after death, usually in a simple container. No viewing or visitation is involved, so no embalming is necessary. A memorial service may be held at the graveside or later. Direct burial usually costs less than the ‘traditional,’ full-service funeral. Costs include the funeral home’s basic services fee, as well as transportation and care of the body, the purchase of a casket or burial container and a cemetery plot or crypt. If the family chooses to be at the cemetery for the burial, the funeral home often charges an additional fee for a graveside service. The body is cremated shortly after death, without embalming. The cremated remains are placed in an urn or other container. No viewing or visitation is involved, although a memorial service may be held, with or without the cremated remains present. The remains can be kept in the home, buried or placed in a crypt or niche in a cemetery, or buried or scattered in a favorite spot. Direct cremation usually costs less than the ‘traditional,’ full-service funeral. Costs include the funeral home’s basic services fee, as well as transportation and care of the body. A crematory fee may be included or, if the funeral home does not own the crematory, the fee may be added on. There also will be a charge for an urn or other container. The cost of a cemetery plot or crypt is included only if the remains are buried or entombed.